Dogs are wonderful people 😉! Part of the reason we love them is because they have a vibrancy and excitement for life. If I could wake up and thrive everyday like my dogs wake up, I certainly wouldn’t need coffee! 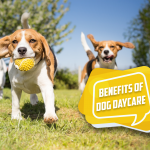 However, sometimes that excitement turns into a hyper dog and that gets a little overwhelming and can create stress, aggressive behavior and other negative behavioral problems. 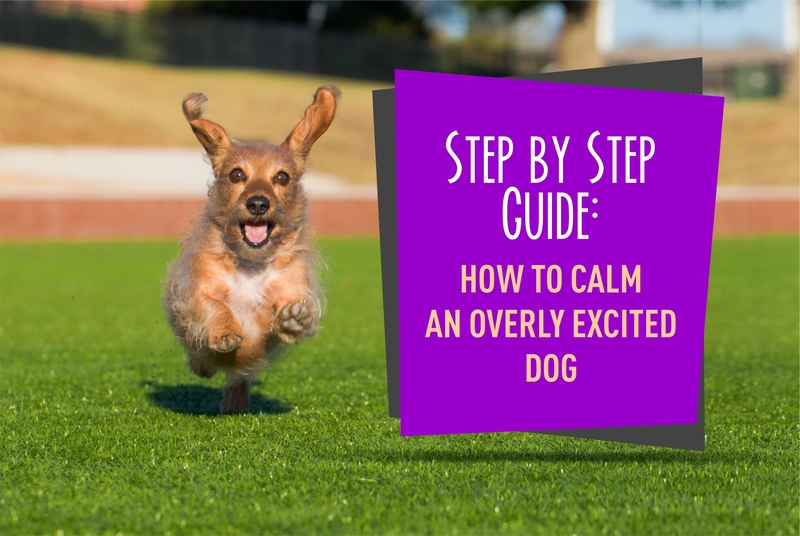 Let’s take a look at some simple steps you can take to calm an overly excited dog. First off, I would like you to honestly assess your current lifestyle. How often are you home? How long are your work days? How do you spend your days off? Are you constantly pulled away by kids sports and other goings on? How much time do you spend on your cell phone or social media? Be honest with yourself and be honest with your dog. What activities can be shortened so you have more time to meet your dog needs? Dogs require time. The number one cause of hyper and overly excited dogs is lack of appropriately meeting their needs. The more hyper your dog is on a daily basis; the more exercise and mental stimulation needs you must meet in order to make them happy! And, often we have to reorder our own lives in order to ensure that we are giving them the time and life that they deserve. Even as a professional dog trainer I struggle some days to give my dogs all the time and attention they need! Interestingly, if you are looking for a couch potato, Greyhounds make wonderful dogs! One of the major things that all hyper or active dogs need is physical exercise! And, physical exercise makes for a tired dog! I have a very high drive dog with a very strong prey drive, he is a Belgian Malinois and they are known for having extreme excess energy and a desire to work almost constantly. This constant desire to work is what makes them excellent police, military and protection dogs. I was explaining to one of my work friends the other day that he literally doesn’t ever walk (unless I take him on a walk on leash and he is doing obedience), he literally is either running or bouncing. He actually bounces like a kangaroo when I bring him inside from being outside. And, although it is adorable (in my humble opinion, since he doesn’t actually jump on me) it is just one example that manifests how much exercise he requires in order to have his needs met. I bought a lateral recumbent trike just so that I could give him the exercise he demands in order for him to be normal and happy. I allow him to pull me, in a pulling harness, around the neighborhood until his tongue hangs down and he is tired. 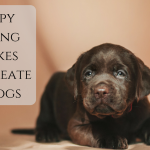 Being a dog trainer and having access to fun exercise toys like bikes can be invaluable to meeting my dogs’ needs and helping them lead calmer lives when we are at home. And, don’t think this is terrible abuse! When he sees his harness he can barely contain his excitement and he runs over to the trike so we can get started. After all, I don’t physically have what it takes to wear this dog out with my own physicality. A stroll around the neighborhood or even a run at my pace is not fast enough or long enough for him to meet his needs! Don’t worry, I always have my dogs’ x-rayed at the veterinarian prior to any pulling or strenuous exercise. I want to ensure that physically I am not causing damage when he is pounding the pavement. Your dog is an athlete, he needs hard, structured exercise, unless he is a puppy and still growing. Your puppy should not be pounding the pavement like I allow my adult dog to do, but that doesn’t mean your puppy can’t be exercised. Puppies can go on hikes, play retrieve games, go swimming and run hard on grass or soft ground. Hiking, retrieve games, swimming, pulling a cart or even pulling heavy items like tires or weights can also be great activities for your adult dog. Need help finding a lateral recumbent trike? Click here. Swimming is one of my favorite doggy exercises. As a judge for Ultimate Air Dogs (a dock diving organization) I have taught hundreds of dogs to swim safely. 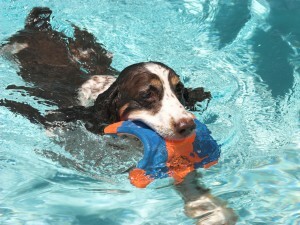 And, spending time allowing my dogs to swim and retrieve their toys is great for their whole body. Some dogs even like swimming with other dogs which can help motivate them to swim farther and faster. I swear 20 minutes of hard swimming can lead to a very satisfied and tired dog. I am still not a huge lover of dog parks anymore. 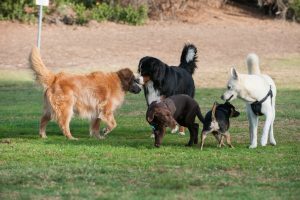 I wrote an article on this not long ago, and I will stand by the fact that most people are too distracted and just simply don’t keep an eye on their dog and how they are interacting with the other dogs at the park. However, I have a few good friends who still enjoy taking their dogs to the dog park to play. At one point in time in my training career I had a dog that did LOVE the dog park and it is a quick and easy way to calm an excited dog. 30 minutes or more of hard play can be just what your dog needs some day! Just please don’t fall into the pitfall of using this as an excuse not to train. I find that dogs who get all of their exercise and stimulation from the dog park have little to no impulse control. After all, if you are constantly running around playing “tickle and poke” and tackling other dogs you just aren’t learning to control yourself. 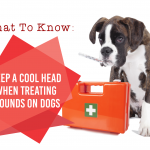 So even though this will help you take home a calm dog, this certainly is no quick fix. 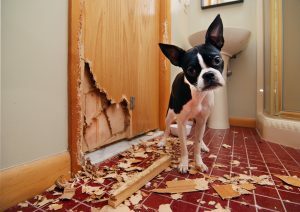 Bad behavior is a result of your dog not knowing what to do with himself. Teach him a command or a cue. When he is tired, as described above, he cares less about getting into bad behavior. Dog barking either indoors, outdoors, or when he wants something is the perfect example of how your dog doesn’t understand how to deal with his boredom and excitement. Remember, your dog can’t watch television, he can’t play video games, he can’t read a book and he can’t play on social media. All the things we do to entertain ourselves are usually not options for your dog. If you locked me alone in a room with 4 white walls and a sofa, I would probably eat the sofa and learn to sing or make a lot of noise too in order to entertain myself. I tell all my clients that if their dog or puppy or any pet really, is driving them crazy then they are probably trying to express to them that their needs aren’t being met appropriately. One of my clients was visiting me at my veterinary technician job yesterday and explaining how her Berger Picard puppy who is 12 weeks old is spending a lot of time nipping. When asked how much exercise he was getting she assured me that he was being walked and trained daily. Thankfully my veterinarian friend chimed in and asked how much exercise and training. He was being walked maybe twice around the yard and trained one to two times daily. This puppy simply needs more physical exercise and mental stimulation. When they meet his needs, he will be too tired to bite! Leashes certainly add to control! I like leashing my dogs around the house. And adding a cue as I teach behavior . Stress also causes excitement in dogs. Anxiety shows itself in many forms. Although to us humans, stress causes us a general feeling of tiredness and irritability and usually doesn’t result in excitement (although I suppose sometimes it does) in dogs it causes a feeling of loss of control. Loss of control of a situation or feeling can cause dogs to default into running around, and jumping and showing all kinds of “busy” behavior. 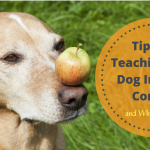 Teaching your dog attention can be a life saver! This is why when we have company over to the house or take our dogs to places they have never been, excitement and bad manners can rear their ugly heads. Anxiety leads to bad manners. Try to give your dog some coping mechanisms and teach him how to deal with stress. As you can imagine, being a police dog is stressful work, however when we are training these dogs we teach them coping mechanisms and how to deal with stress in a healthy way so that basically no situation bothers them but of course this kind of training takes time! Anxiety is no fun. Solliquin is a great supplement that can help ease stress in your dog. Obedience training and mental stimulation is really what you need to calm an excited dog. Sure, as we discussed he needs exercise, but what he really needs is training. Remember the police dog in the last paragraph and my mentioning that we teach them coping mechanisms? These coping mechanisms come with consistent dog obedience training. Eye contact is my favorite kind of training. Teach your dog this kind of training and you won’t be disappointed in the results. When left to his own devices, dogs burn off energy by doing “dog” things like play bowing and running and jumping and flying around furniture. They jump on counters, they bark, they steal trash and they do things that naturally make them feel good. If you aren’t him in basic, intermediate and advanced obedience, you aren’t allowing him to make good decisions when he feels stress or when he gets excited. He literally doesn’t know what to do in these situations. Your dog needs training and “school” just like your kids need school in order to learn. Can you imagine expecting your 3-5 year old to make correct decisions all of the time without any kind of education or time on your part? Absolutely not! We spend an incredible amount of time teaching and educating our children. We take them on daily excursions, we let them play, we encourage their playing with others. We even enjoy watching them play with others. 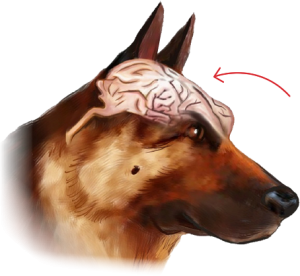 Not only do dogs need obedience training and mental stimulation in order to be good canine family members, they need obedience training and mental stimulation in order to be happy. They also need teaching and training and the opportunity to play with others! 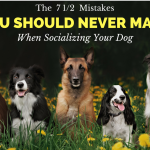 Just like your children, in order to become well behaved and have good manners, our dogs need to be exposed to all kinds of thing and people in our environment. Check out the Clik-R for your positive reinforcement training. Again, we all have different likes. I like to draw, I also like to read but dogs can’t do either of these things. We must find things that our dogs enjoy being a part of! 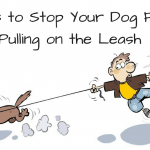 My dogs like to pull, they also like to run but I have also taught them that they can enjoy obedience when I teach them. This is why I believe that working dogs like Guide Dogs, Service Dogs, Hearing Dogs and Police Dogs are some of the happiest dogs on earth. They know what to do in any given situation and their training is extensive. I have taught my dogs to help me with laundry. Can I do my own laundry? Yes! Absolutely! But my dogs feel special when I ask them to help me with house hold chores.. They can hand me laundry, they can pick up things that I drop and they can turn on and off lights. This helps them feel like they have a job and they are needed in my life; which makes them happy. Even though I don’t necessarily need them to do laundry, pick things up and get the lights or grab my shoes these skills make them happy. And, happiness keeps them out of trouble and gives them an outlet for their energy! After all, my job as a dog owner is to keep my dog happy and to give him something to do! The more you train, the happier your dog can be! 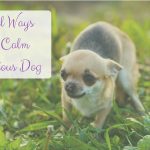 Tell us what calms your dog in the comments below! 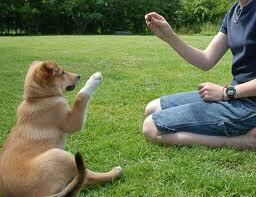 I have been a professional dog trainer and pet sitter for over 20 years. I am a Certified Professional Dog Trainer, through the international Certification Counsel of Professional Dog Trainers. 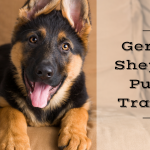 I have trained and worked with police, Schutzhund and personal protection dogs. 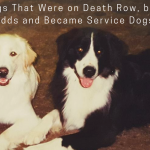 I trained Assistance Dogs in a men’s prison and ran my own nonprofit organization to take adult dogs from shelters and to train them to assist children and adults with disabilities, at no charge to my clients. My nonprofit organization and I were nominated for several awards of merit and even made the front page of the Denver Post. I was a veterinary technician for many years, where I learned about all aspects of health and preventative medicine. I have trained and worked with exotic animals and cheetahs. I introduced a temperament testing program in my local shelter and sat on the board of directors. I volunteered with my dog “Mr. Snitch” and helped local children learn to read. I have attained obedience titles and several blue ribbons. I am constantly in search of ways to continue my education and excellence when it comes to animals, their behavior and their health. 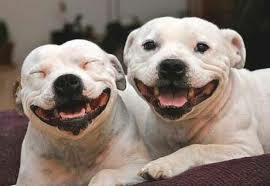 Start Calming Down Your Over Excited Dogs Today! Sign up below and we’ll email you your first “Training For Calm” lesson to your inbox in the next 5 minutes.